Colchester United scored four goals in a stirring second-half display as they fought back to beat Doncaster and climb off the bottom of the League One table. Debutant loan signing Gary McSheffrey put Rovers ahead in a drab first half, running through and calmly slotting in. The U's did not manage a shot on target but were rampant in the second period and Chris Porter's strike made it 1-1. A Elliott Lee curler and Alex Gilbey's fine strike earned a commanding lead before Richard Brindley sealed victory. Doncaster would have moved out of the relegation zone with a win following Blackpool's draw with Bury and seemed well set after McSheffrey's cool finish. But Colchester's astonishing second-half response earned just a seventh league win of a miserable season to take them above Crewe, who lost to Sheffield United. Match ends, Colchester United 4, Doncaster Rovers 1. Second Half ends, Colchester United 4, Doncaster Rovers 1. Corner, Doncaster Rovers. Conceded by Alex Gilbey. Joe Edwards (Colchester United) wins a free kick on the left wing. Goal! Colchester United 4, Doncaster Rovers 1. Richard Brindley (Colchester United) left footed shot from the centre of the box to the bottom right corner. Corner, Colchester United. Conceded by Aaron Taylor-Sinclair. Riccardo Calder (Doncaster Rovers) wins a free kick in the attacking half. Corner, Colchester United. Conceded by Riccardo Calder. Attempt missed. George Moncur (Colchester United) left footed shot from outside the box misses to the right. Substitution, Doncaster Rovers. Riccardo Calder replaces James Coppinger. Goal! 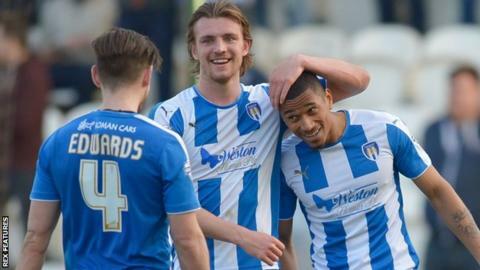 Colchester United 3, Doncaster Rovers 1. Alex Gilbey (Colchester United) right footed shot from outside the box to the top right corner. Goal! Colchester United 2, Doncaster Rovers 1. Elliot Lee (Colchester United) right footed shot from outside the box to the top right corner. Assisted by Nicky Shorey. Attempt saved. Elliot Lee (Colchester United) right footed shot from the left side of the six yard box is saved in the bottom left corner. Substitution, Doncaster Rovers. Andy Williams replaces Cameron Stewart. Gavin Massey (Colchester United) wins a free kick on the left wing. Attempt missed. Alex Gilbey (Colchester United) right footed shot from the centre of the box is high and wide to the left. Substitution, Doncaster Rovers. Gary Mackenzie replaces Cedric Evina. Attempt saved. Owen Garvan (Colchester United) left footed shot from outside the box is saved in the centre of the goal. Goal! Colchester United 1, Doncaster Rovers 1. Chris Porter (Colchester United) right footed shot from the centre of the box to the bottom left corner. Assisted by Gavin Massey. Corner, Colchester United. Conceded by Cedric Evina. Attempt missed. Owen Garvan (Colchester United) left footed shot from outside the box is close, but misses to the right. Attempt saved. Elliot Lee (Colchester United) right footed shot from the centre of the box is saved in the centre of the goal. Second Half begins Colchester United 0, Doncaster Rovers 1. First Half ends, Colchester United 0, Doncaster Rovers 1. Foul by Gary McSheffrey (Doncaster Rovers).